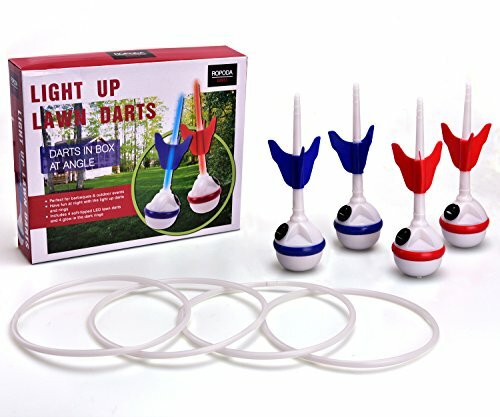 Enjoy a classic outdoor game with family and friends with the EastPoint Sports Lawn Dart Set with Caddy! 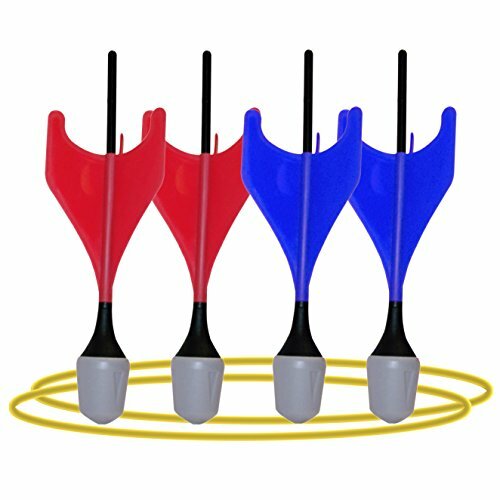 This aerodynamic twist on horseshoes features weighted round-bottom darts that are safe and easy to throw. Players take turns tossing their team's darts at the target rings. The bright colors and upright-standing darts make it easy to spot equipment in the yard or in grassy parks. Target rings are equally visible and constructed to be all-weather so they'll stay tough in any conditions. Fun for all ages and skill sets, this game is an easy throw into the mix of fun at your next party or barbecue! With the convenient carry caddy, you can take your game set anywhere the action is! Includes 4 plastic round-bottom darts in 2 team colors, 2 all-weather target rings, and 1 caddy. 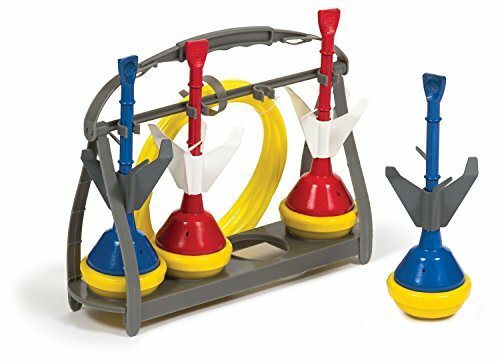 Matty's Toy Stop Deluxe Lawn Darts Set with 4 Lawn Darts, 2 Target Rings & Storage Bag, is AWESOME! 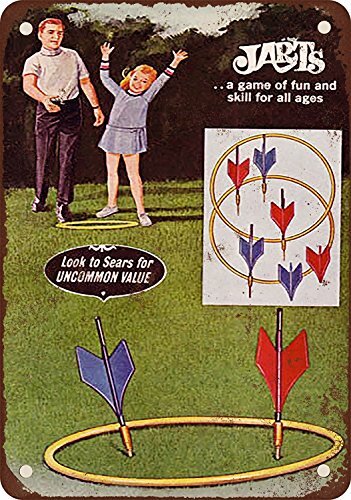 Lawn Darts is a safe and fun way to entertain the entire family while getting them out of the house. Test your accuracy with an aerodynamic twist to the classic game of horseshoes that's designed to be played at the park, beach or backyard. During each round, 1 player from each team stands in the Toss Area and alternates tossing their 2 colorful darts at the target ring. The objective is to be the first team, or player, to score 21 points. The dart design features a built in safety tip to make this game even safer for the whole family. 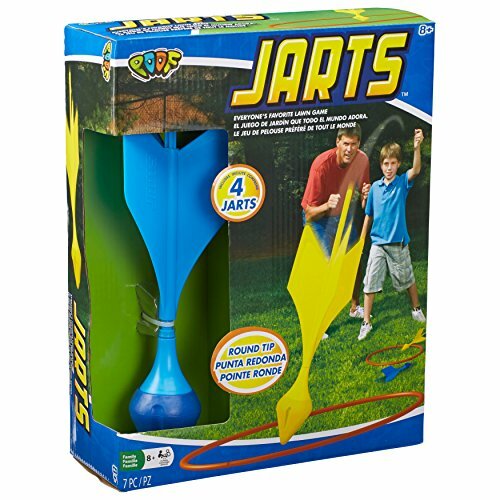 Created for both fun and safety, these Lawn Darts are back and better than ever! Set up your target rings and let em fly! Makes a great gift & is perfect for the holidays, travel, beach, schools, backyard, the lake, indoor, outdoor & promotions and so much more! For Ages 6 and up - Fun for the whole family! Tell family and friends that you'll bring the chicken to your next family gathering! Flicking' Chicken is a crazy new yard game played with. rubber chickens! Players toss the target to get started, then take turns flicking' their chicken at the target. After nine rounds, the player with the lowest score wins. Sounds easy enough, but these funky chickens bounce and roll, so hitting the target will test your chicken flicking' skills! Funny and fun for two to four players. 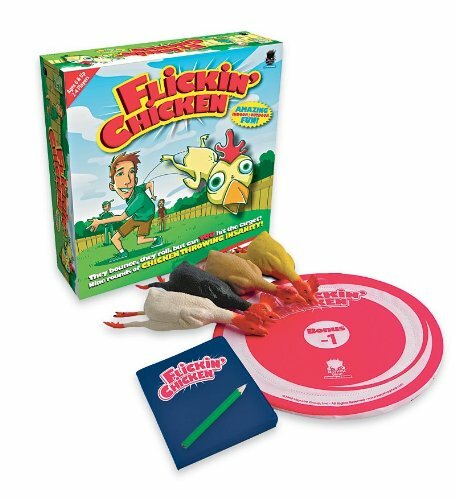 Great family game Fun for players of all ages Includes four rubber chickens, a target disc, and score pad For 2-4 players Award winner for ages 6 and up. How do you Flick your Chicken? Imagine rubber chickens meet miniature golf. Players take turns throwing the target disc and then flick their chickens at the disc. Where the chicken lands is where the player flicks it again until the chicken hits the target. Beware these chickens bounce and roll so you never know how many flicks it will take. The number of flicks it took to land on the target is your score for that round. The player with the lowest score after nine rounds of Chicken Flicking insanity is the winner. 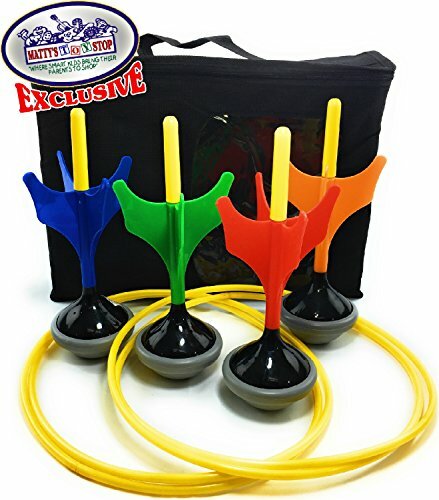 ROPODA LED Ring Toss-Lawn Darts Game-Glow In The Dark Game Set-Outdoor Family Game for Backyard, Lawn, Beach and More. 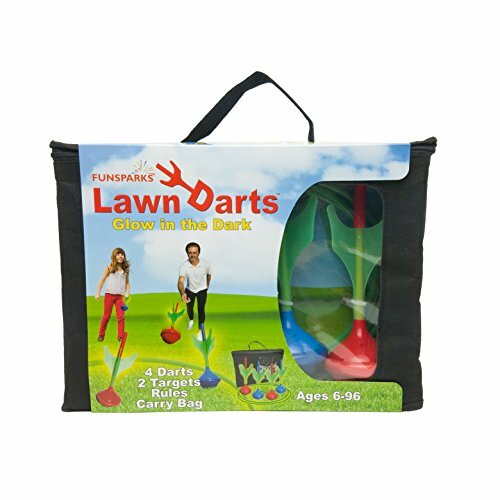 This glow in the dark Lawn Darts game is a safe and fun way to entertain the whole family while getting them out of the house.Classic outdoor game for kids, adults, and truly fun for people of all ages. Bringing along a set to play is sure to liven up any beach day, backyard get-together, or outdoor party and provides entertainment for your family and friends for memories that will last a lifetime.These soft darts are not bouncing around while playing on a soft surface like grass, sand.It can also be played indoors on a soft carpet, but don't throw the darts on wall or any hard surfaces because something could break. 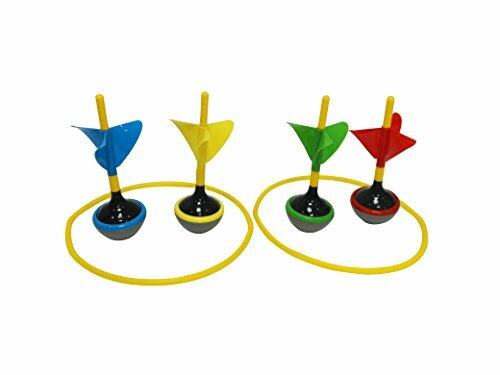 During each round, 1 player from each team stands in the "Toss Area" and alternates tossing their 2 colorful rings at the glow in the dark target darts.The objective is to be the first team, or player, to score 21 points. A true classic outdoor toss game. Players attempt to land their darts inside the target to score points and win. Easy to learn and quick play rules make it ideal for kids and adults. Includes 2 red darts, 2 blue darts, 2 targets and instructions. Lawn Darts: Illegal - But Lethal?